LEWISVILLE, Texas, August 22, 2017 – Soraa, a leading developer of solid-state lighting products, was established on the principles of revolutionary product research and development. In fact, their first product offering broke new ground in the light-emitting diode, or LED, market with a light source that surpassed industry standards in color, quality and brightness. 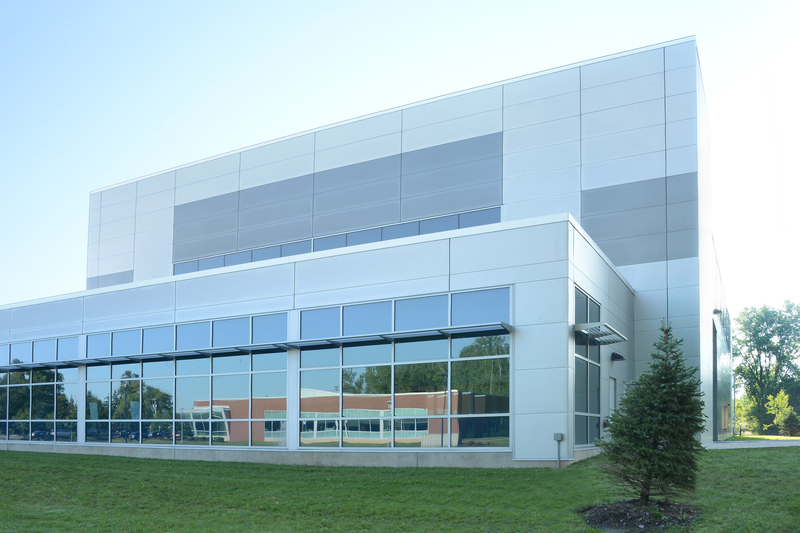 It’s only fitting that the company’s new, 82,500-square-foot manufacturing facility showcases the industry’s most modern, high-performance building envelope technology by Metl-Span. Founded in 2008 by a brilliant team of engineering professors including a Nobel Prize winner, Soraa quickly outgrew its Fremont, Calif.-based manufacturing facility. Plans were made in late 2015 to develop a state-of-the-art semiconductor fabrication plant at the booming Collamer Crossing Building Park in DeWitt, N.Y., a suburb of Syracuse. Providing a mix of office space, warehouse and fabrication facility, the state-funded project could bring an estimated 420 new jobs to the area. “The single-story portion is dedicated to administration, the two-story section is strictly for manufacturing and cleanroom technology,” said Mike Lundy, vice president, metal wall panel division at installer Ajay Glass Co. The project’s smooth, flat exterior incorporates over 22,000 square feet of Metl-Span three-inch, 22/26-gauge CF Architectural wall panels in a blend of Regal White and Granite hues. The design team from EYP Architecture & Engineering was drawn to the product’s superior flatness. 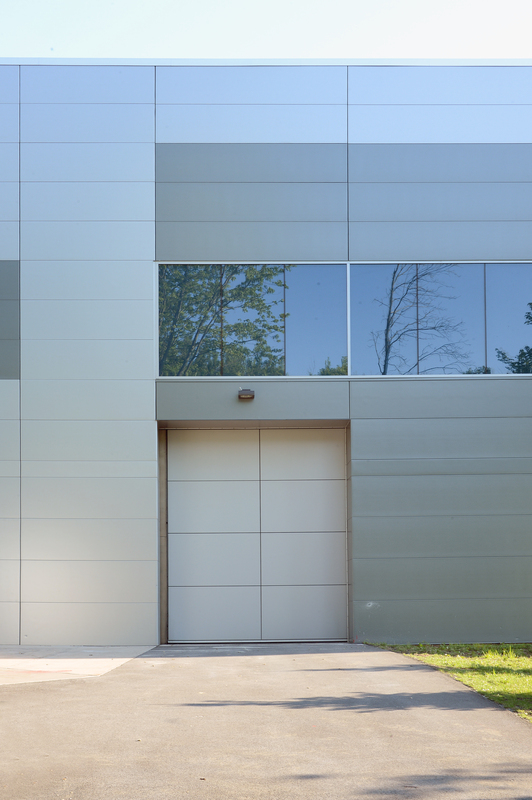 With concealed clips and fasteners and double tongue-and-groove joinery, CF Architectural insulated metal wall panels bring an exceptional level of design flexibility and value to high-profile applications like the Soraa fabrication plant. The Granite panels—implemented in wide, balanced horizontal stripes spanning multiple facades—serve as a striking accent to the monolithic Regal White panels that make up the bulk of the building envelope. 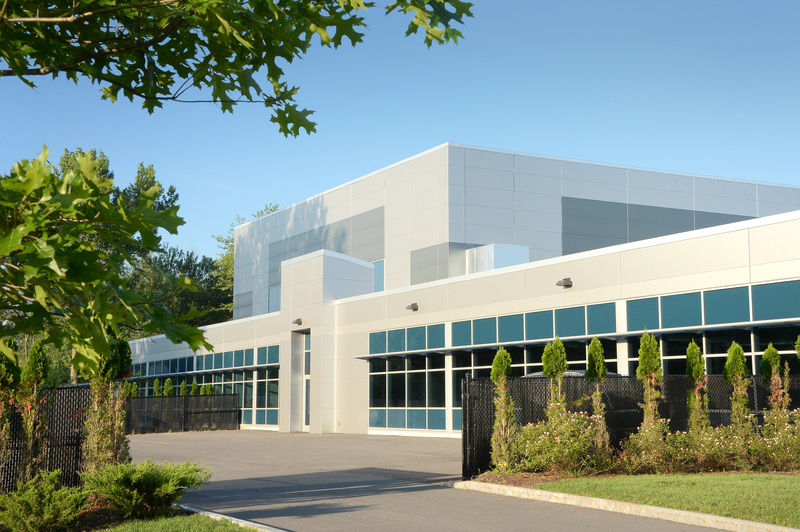 With its dueling colors and gleaming metal veneer, the fabrication plant has quickly become one of the most prominent buildings in the business park, but the insulated metal panels offer more than just aesthetics. Metl-Span CF Architectural insulated metal wall panels rely on a high-performance polyurethane foam core injected between steel faces. The wall system provides exceptional thermal efficiency and all-weather control. The highly economical insulation process also delivers an added advantage by minimizing building energy usage and construction costs. And expediting the building enclosure reduces construction downtime to make way for interior trade work. Available in multiple thicknesses as well as horizontal and vertical orientations, Metl-Span insulated metal wall panels provide the industry’s leading thermal and moisture performance technology in a single component. The unique single-component construction provides a number of advantages that can have a dramatic effect on the bottom line. 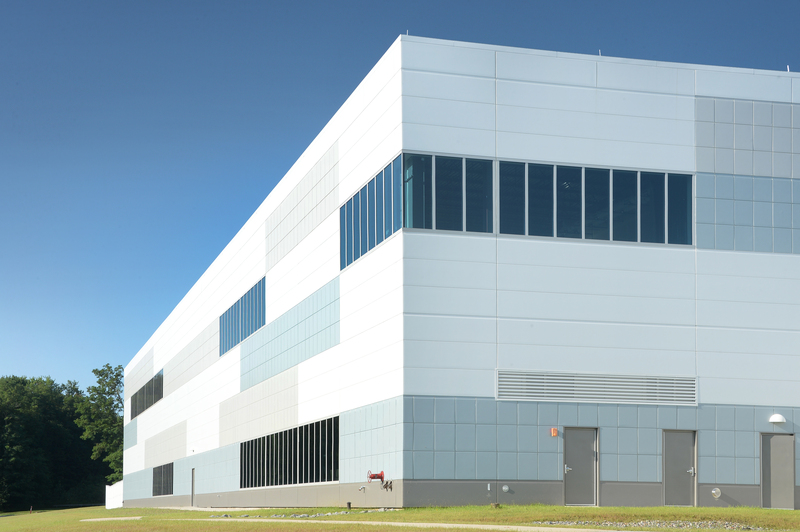 A composite panel consisting of metal skins and a foam insulating core, insulated metal panels provide the four critical barriers: air, water, thermal and vapor. Conventional, multi-component building envelopes address the critical weather barriers with multiple product sources and installation steps. In fact, multiple component wall systems can feature as many as five separate components. These complex wall assemblies require an equally complex installation process, often requiring multiple manufacturers and trade contractors. This leads to more difficult coordination issues and a greater risk of building envelope failures due to incompatible components, not to mention additional costs and time restraints. The layers required for a complete multi-component wall system present challenges for the architect and contractor, particularly to avoid moisture entrapment. Imperfections in any of the critical barriers can lead to moisture entrapment within the building envelope, which could lead to material degradation and the development of harmful mold. Installation of the high-performance building envelope wrapped up in the summer of 2017. Efforts are currently underway to finalize interior finishes and install Soraa’s complex manufacturing equipment, with plans to open by year end. 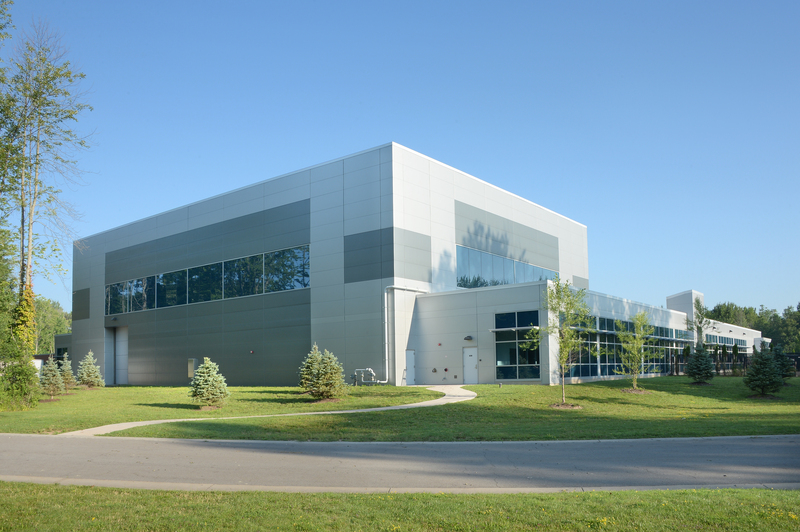 The new Soraa semiconductor fabrication plant marks the second project in the Collamer Crossing Building Park to feature Metl-Span CF Architectural insulated metal panels. Just across the street is the new, 52,000-square-foot Central New York (CNY) Film Hub, which houses a cutting-edge studio and soundstage as well office space and conference rooms for local film students. The two projects and their gleaming metal building envelopes represent the state’s successful efforts to bring West Coast innovation, ingenuity and industry to Central New York. Installer: Ajay Glass Company, Canandaigua, N.Y.